Myocardial infarction is now the most common cause of death in the UK and other developed countries, but was hardly known before 1910. It almost always occurs in patients with coronary atheroma because of sudden coronary thrombosis. This usually develops at the site of a fissure or rupture of the intimal surface of an atheromatous plaque. Haemorrhage may occur into a plaque and local coronary spasm may develop. 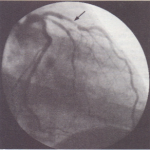 Sometimes thrombosis results from stasis at a critical stenosis or in association with coronary spasm. About 6 hours after the onset of infarction the myocardium is pale and swollen, and at 24 hours the necrotic tissue appears deep red owing to haemorrhage. In the next weeks an inflammatory reaction develops, lymphocytes infiltrate and the infarcted tissue turns gre . Necrotic tissue is replaced by mononuclear cells, and gradually a thin fibrous scar develops. Myocardial infarction presents with chest pain, similar in character to exertional angina pectoris, but usually occurring at rest and lasting for some hours. The pain may be so severe that the patient may fear imminent death (‘angor animi’), but it may be less severe and mistaken for indigestion. It is usually sudden in onset, but it may develop gradually. The pain of myocardial infarction is often associated with restlessness and the patient usually cannot remain still. Sweating, nausea and vomiting are often associated with myocardial infarction. About 20% of patients with myocardial infarction have no pain. Diabetics, hypertensives and elderly patients often have ‘silent’ myocardial infarctions. In these cases the myocardial infarction may go unnoticed or may produce hypotension, breathlessness or arrhythmias. Physical signs Often there are no specific physical signs unless complications develop, but the patient appears pale, sweaty and grey. Hypotension, which may first occur several hours after the onset of infarction and may increase over the following 3-4 days, abnormal precordial pulsation due to the systolic bulging of the infarcted myocardium, an additio nal heart sound (particularly a fourth heart sound), and sinus tachycardia may be noted in some patients. A raised venous pressure and basal crackles are common. As the infarction progresses, a modest fever (up to 38°C) due to muscle necrosis and lasting for up to 7 days occurs. A pericardial friction rub may develop. Non-specific abnormalities such as an increased erythrocyte sedimentation rate (ESR) (up to 70 mm in the first hour) and a polymorphonuclear leucocytosis (up to 20 x 109/litre) may occur in the first few days following myocardial infarction. CREATINE KINASE (CK) is released by infarcted myocardium and peaks within 24 hours. It is usually back to normal before 48 hours. It is also produced by damaged skeletal muscle and brain. The myocardial-bound (MB) isoenzyme fraction of CK is specific for heart muscle damage. A several-fold increase in total CK, but not in CK-MB, can be produced by an intramuscular injection. Cardioversion can increase both the total CK and the MB isoenzyme fraction of CK. The size of the infarction determines the total enzyme release with larger infarcts producing higher serum levels. ASPARTATE AMINOTRANSFERASE (AST), which was formerly called serum glutamic oxaloacetic transaminase (SGOT), peaks at 24-48 hours and may fall to normal by 72 hours. AST is also released by damaged red blood cells, kidney, liver and lungs. 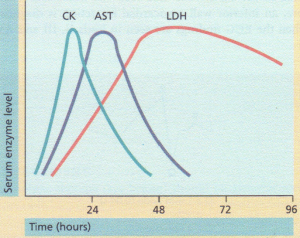 LACTIC DEHYDROGENASE (LDH) peaks at 3-4 daysand remains elevated for 10-14 days. LDH is not only present in cardiac muscle but is also released from damaged liver, skeletal muscle and red blood cells. There are five isoenzymes, and cardiac necrosis causes a predominant increase of LDH 1, which can also be measured as hydroxybutyrate dehydrogenase (HBD). TROPONIN T AND MYOGLOBIN are also released early (2-4 hours) following myocardial infarction. Troponin T is a regulatory protein with a high specificity for cardiac injury and is not raised if skeletal muscle damage is present. Elevation of cardiac troponin persists for up to 7 days. Enzymes are usually estimated for the first 3 days following a suspected myocardial infarction. The first assay is often normal and subsequent assays will show a threefold or more increase in the majority of cases. With reperfusion after thrombolytic therapy the enzyme rise may be curtailed. CK or CK-MB are the enzymes which should be requested within 24 hours of the suspected infarction. After this period, AST and LDH are more likely to be elevated. The enzyme profile in acute myocardial infarction. 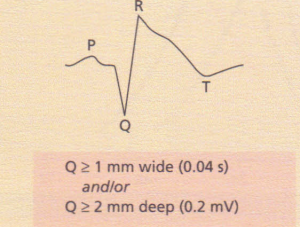 A Q wave is a broad (> 1 mm) and deep (>2 mm or more than 25% of the amplitude of the following R wave) negative deflection that starts the QRS complex. 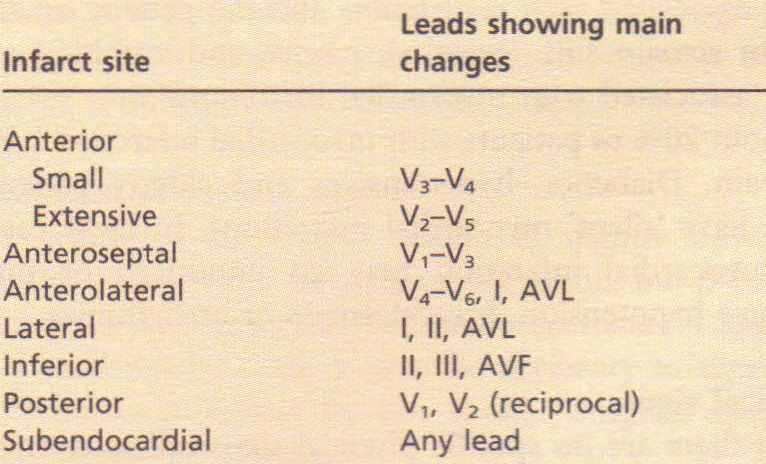 It may occur normally in leads AVR and VI (and sometimes in lead III), but in other leads it is abnormal. Abnormal Q waves are produced by several abnormalities such as left bundle branch block, ventricular tachycardia and the WPW syndrome. The gradual development of Q waves over minutes or hours suggests the occurrence of a full-thickness (as opposed to a subendocardial) myocardial infarction. They develop because the electrical silence of infarcted cardiac tissue results in a so-called ‘window’ through which the normal endocardial-to-epicardial activation of the opposite noninfarcted ventricular wall is ‘seen’ resulting in an unopposed depolarization front moving away from an electrode situated over the epicardial surface of the infarct . Q waves are usually permanent electrocardiographic features following full-thickness myocardial infarction. T wave and ST segment changes result from ischaemia and injury. They are therefore often transient, occurring only during the acute attack. 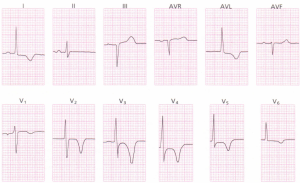 The progressive changes or evolution of the ECG during the course of a full-thickness myocardial infarction are illustrated. With subendocardial infarction only the endocardial surface is infarcted and Q waves do not develop. ST segment and T wave changes are therefore the only ECG features of a subendocardial infarction. Because the injury is endocardial rather than predominantly epicardial, ST segment depression rather than elevation is usual. 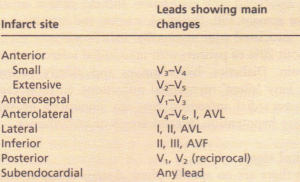 Typically ECG changes (Table 11.26) are usually confined to the ECG leads that ‘face’ the infarction. 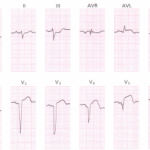 Therefore, an inferior wall myocardial infarction is diagnosed when the ECG findings are seen in leads II, III and A VF Lateral infarction produces changes in leads I, II and AVL. 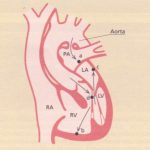 In anterior infarction, leads V2-VS may be affected. Changes seen in an anterolateral infarction are shown. Because there are no posterior leads, a true posterior wall infarct is usually diagnosed by the appearance of mirror image or reciprocal changes in leads VI and V2, i.e. 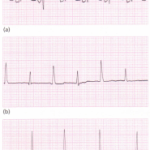 the development of a tall initial R wave, ST segment depression and tall, upright T waves. These reciprocal changes can also be seen in association with other infarctions. For example, in an inferior wall myocardial infarction, anterior ST segment depression may be seen. 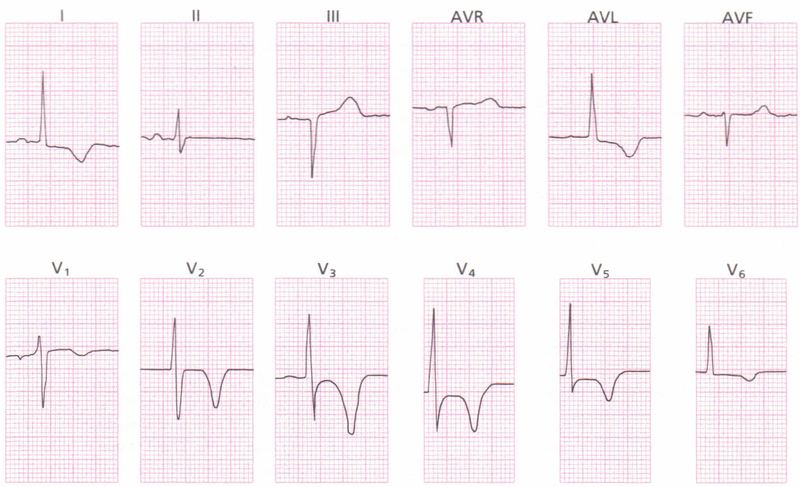 A normal ECG, especially early in the presentation, does not exclude myocardial infarction. Electrocardiographic evolution of myocardial infarction. 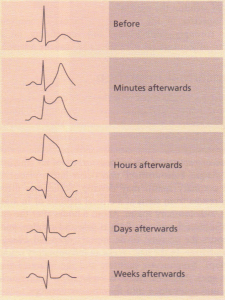 Typical ECG changes in myocardial infarction. This test is particularly useful when the ECG is unhelpful because of pre-existing abnormalities such as left bundle branch block. Imaging is performed about 2 hours after the injection of the isotope to detect the infarcted area.